The Addiction Science Award is coordinated by the Friends of NIDA, a coalition that supports NIDA's mission. With scientific expertise from NIDA, the awards are given to three exemplary projects on the topic of addiction science. It is part of the Intel International Science and Engineering Fair (ISEF), the world's largest science competition for high school students. What is the Addiction Science Fair Award? Every May, close to 1,800 students from more than 75 countries compete in the Intel International Science and Engineering Fair (ISEF), the world's largest science competition for high school students. Since 2008, judges with expertise in addiction research have selected three projects for the Addiction Science Awards at the fair, showcasing exemplary work in research projects related to substance use disorders, including their prevention and treatment. NIDA provides judges with scientific expertise, and small cash awards are provided by Friends of NIDA, a private coalition that supports NIDA's mission. The first place winner receives $2500, the second place winner receives $1500 and third place winner receives $1000. 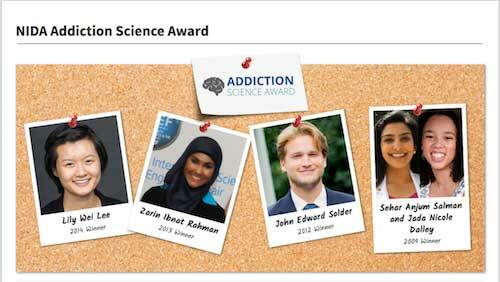 The Addiction Science winners are announced at the Special Awards ceremony at the Fair, and NIDA invites them to visit our headquarters at NIH in Bethesda, Maryland to present their projects.